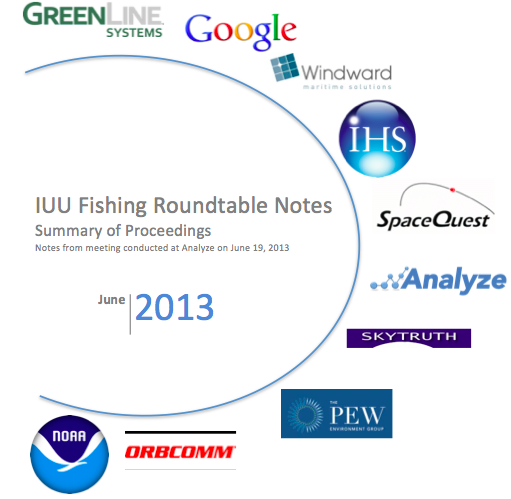 On June 19, Analyze hosted the first Illegal, Unregulated, and Unreported (IUU) Fishing Roundtable. With attendees from the United States, United Kingdom, and Israel, the Roundtable brought together the most influential players in the campaign against IUU fishing, including the National Oceanographic and Atmospheric Agency, Pew Charitable Trusts, Google, SpaceQuest, Greenline Systems, IHS Fairfplay, Windward Maritime Solutions, OrbComm, and SkyTruth. Read more about the meeting by downloading Analyze's report.